A delicious tart for any time of year. 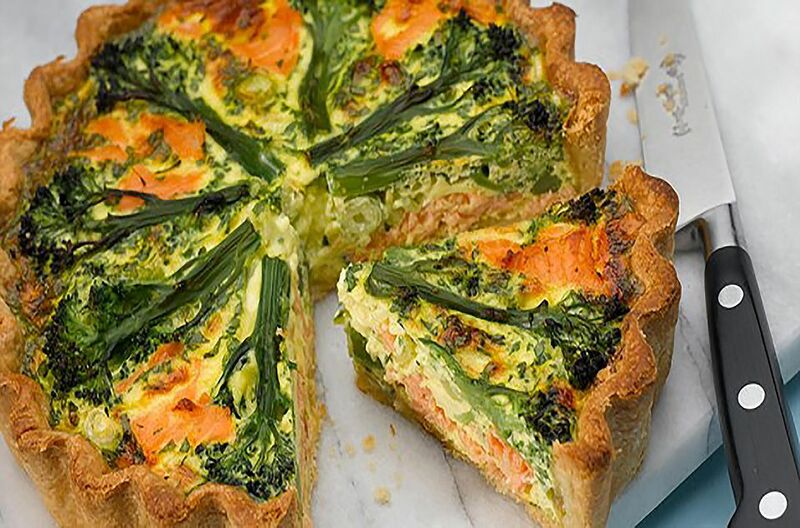 The Tenderstem Broccoli and Salmon Tart is packed with goodness from the vitamin packed broccoli to the omega rich salmon. To make this an even better tart ensure you use fish from a sustainable source, ask your fishmonger or supermarket if you are not sure. Place the flour and salt into the bowl of a food processor. Add the butter and 2 tbsp of cold water. Pulse mix until all the ingredients are incorporated into a dough, add more water a tsp at a time if the mixture doesn’t stick together and pulse again. Wrap in plastic wrap and rest in the refrigerator for 2 hours. Butter a /25cm (10-inch) loose-bottomed tart tin. Unwrap the pastry, roll and line the tart dish making sure it is even on the bottom and sides and there are no holes. Prick the base of the dish using a fork. Refrigerate for 30 minutes. Cover the pastry with baking parchment and fill with baking beans, or use long grain rice. Bake for 35 minutes in the preheated oven, remove the parchment and beans or rice and bake for a further 10 minutes until the crust is golden. Leave until completely cold. Lower the oven to 175 C/350 F/gas mark 4. Mix the eggs, egg yolks, cream, spring onions and parsley. Season with pepper and a little salt, if liked (the smoked salmon may add enough salt to your taste). Arrange the smoked salmon and the chopped broccoli stalks in the baked pastry case. Pour the egg and cream mixture over. Arrange the floret end pieces of Tenderstem broccoli in the tart like the spokes of a wheel, with the florets around the edge of the tart. In a hurry buy some ready made pastry or a ready made shortcrust pastry case. Tenderstem is a member of the Brassica family and related to cauliflower and cabbage and is a cross between broccoli and Chinese kale. Tenderstem has a mild, distinctive flavour and a texture more like asparagus than traditional broccoli and is tender from floret to stem so you can eat the whole vegetable. This is unlike ordinary broccoli which tends to have a thicker, and sometimes woody, stem.